A tumbling class will probably do you more good, along with bump drills. I've had a few crashes where the clothes were barely scuffed and I had "carpet burn" underneath them-- pretty much the same as road rash minus the grit. Elbow pads? Try roller derby. Most of the time, we guess them right, sometimes we don't. It's hard to tell. It's now a guilty-until-proven-innocent kinda' thing. Sure. Asking a "generic" question about a particular line of safety gear, and linking a website where you presumably can purchase said particular line of gear is not spam at all. Nope. Nosiree. there's something called 'homologation of risk'. give a bunch of squids full-face helmets, shoulder pads, and knee braces- and i'll guarantee there will be pile-ups in every frikin corner. This argument could easily go down the road of airbags vs sabers. If you knew that your car would deploy sabers instead of a pillow, you'd drive a lot more carefully. I don't think that's where you're going with it, but there's something to be said for it. In MX, you expect to mix it up with other riders. In bike racing, the idea is to NOT mix it up with other riders, but to have the skills to avoid collision. Not a slam on MX. Just a different way of thinking. Riders are free to wear that stuff, but others will give him enough grief to make him cry. Especially on Tuesday nights. Our skills are our protection. The quicker you get them the sooner you're safer. Last edited by EventServices; 12-06-08 at 11:01 AM. Reason: I didn't feel like I was done yet. Pro riders DO wear stuff like that. After they injure themselves and can not afford to aggravate the injury by taking a hit on the same spot. They wear bandages, neckbraces, tape, use extra handlebar tape. Whatever it takes to keep riding. I hit the pavement hard on my right hip in a race in early october. It still hurts. The main reason why it still hurts is because I re-injured it by falling again in the mud in a cross race a month later. What did I learn from that? I learned that when you have mud in your treads, you can tuck the front much more easily when you transition from dirt to pavement. Will that crash happen again? Maybe, but I probably won't be hitting a corner quite as hard again with mud in the tires. Will the second crash happen again? Definitely. That was a mud-corner that nearly everyone in that race biffed at. Would I use hip-padded shorts? I would probably just put a large bandage over the wound and wear my regular shorts over it. I might consider using them if they were free. Crashing is part of racing. I only hope that I will learn how to be fast and not crash "as much". When I saw the subject - I assumed he was going to ask about head phones. I think Id rather see spam than get into that discussion again! Something like this, makes sense, if sewn as a pad on your hips.. In remember seeing a guy in a 3/4 race wear a ton of pads. I pointed him out to a team mate. We laughed and avoided being anywhere near that guy for the whole race. 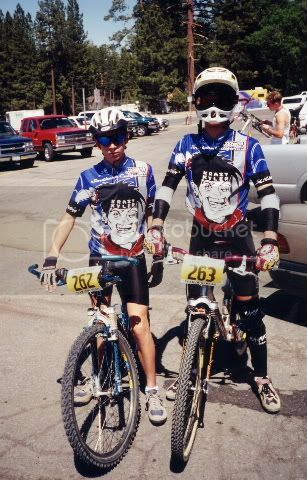 My first MTB race, there was a kid with every pad imaginable, elbow, chest, shin, shoulder, etc. To top it all off his mom was giving him advice and he had a hull face MX helmet. He must have been 16 at least. I would actually consider trying something like that, but the link and the manufacturer's site both don't mention how well the material breathes. Sweat and heat are energy leaving my body. Either way, I can see this as a popular downhill MTB product if it does its job. And yeah, it seems like a shill. Your link goes to a store that has a link to the manufacturer's website. Why not just link to that? We could be wrong, but in case we're not, why do the product pages call them an auction? Also, they can't be 6 panel and 8 panel construction at the same time. 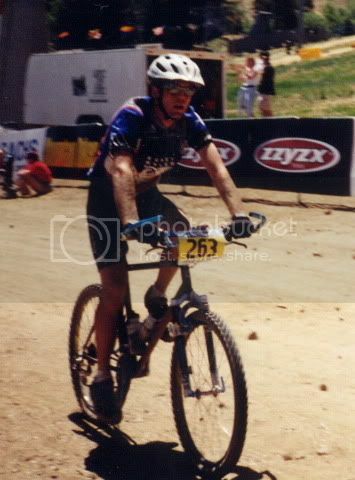 Now, I should let you know that was me getting ready for downhill and dual slalom races in Big Bear, and I put most of those pads to good use washing out on a slick rock face. The next day was cross country, which obviously requires far less protection. Last edited by urbanknight; 12-06-08 at 02:23 PM. Japanese Keirin riders wear body armor. But they elbow each other constantly at 40+ mph. Some of them have pointy elbows. Did not realize the spam thing would be such an issue; I guess I can understand why though. As an FYI, I only meant to post the link to serve as an example of a safety item; its the only thing I know of other than the usual helmet or gloves. For shlts, does anybody have any other cycling specific safety items to post, other than the normal safety gear? The intent of my post was to simply question the norm (god forbid somebody do that) in cycling, as I understand that nobody wears any gear beyond the usual helmet/gloves, ect. To those who provided legitimate and thoughtful responses, Thank you. The reward for not riding with armor like that would trump the benefit of riding with it. Flesh heals. Dura Ace doesn't. HTFU.